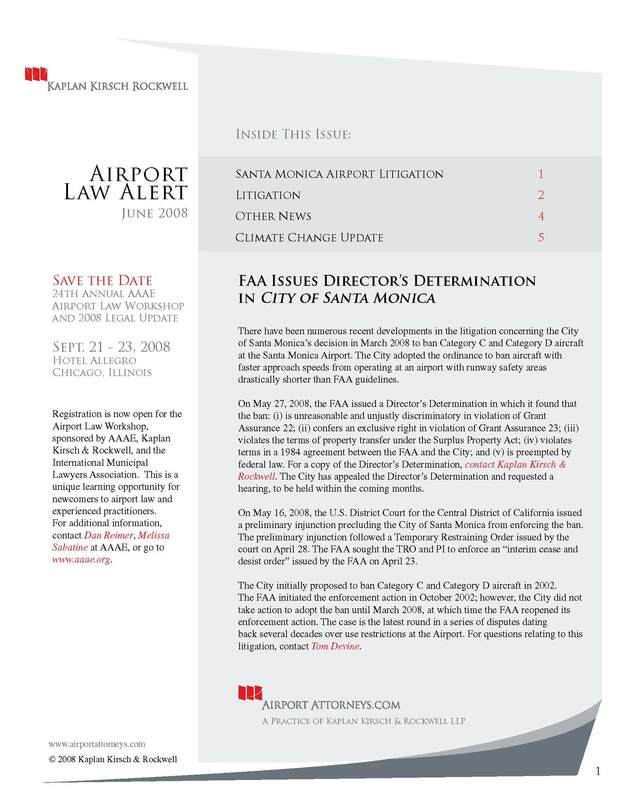 There have been numerous recent developments in the litigation concerning the City of Santa Monica’s decision in March 2008 to ban Category C and Category D aircraft at the Santa Monica Airport. The City adopted the ordinance to ban aircraft with faster approach speeds from operating at an airport with runway safety areas drastically shorter than FAA guidelines. On May 27, 2008, the FAA issued a Director’s Determination in which it found that the ban: (i) is unreasonable and unjustly discriminatory in violation of Grant Assurance 22; (ii) confers an exclusive right in violation of Grant Assurance 23; (iii) violates the terms of property transfer under the Surplus Property Act; (iv) violates terms in a 1984 agreement between the FAA and the City; and (v) is preempted by federal law. For a copy of the Director’s Determination, contact Kaplan Kirsch & Rockwell. The City has appealed the Director’s Determination and requested a hearing, to be held within the coming months. On May 16, 2008, the U.S. District Court for the Central District of California issued a preliminary injunction precluding the City of Santa Monica from enforcing the ban. The preliminary injunction followed a Temporary Restraining Order issued by the court on April 28. The FAA sought the TRO and PI to enforce an “interim cease and desist order” issued by the FAA on April 23. The City initially proposed to ban Category C and Category D aircraft in 2002. The FAA initiated the enforcement action in October 2002; however, the City did not take action to adopt the ban until March 2008, at which time the FAA reopened its enforcement action. The case is the latest round in a series of disputes dating back several decades over use restrictions at the Airport. On April 18, 2008, the U.S. Court of Appeals for the District of Columbia Circuit ruled that the FAA erred when it found that 83 proposed wind turbines adjacent to a planned airport would not constitute a hazard to air navigation. The FAA acted pursuant to FAR Part 77, which requires the agency to consider and protect against threats to existing and proposed airports and projects. Clark County challenged the FAA’s no-hazard determinations on the basis that FAA had failed to account adequately for the new Las Vegas airport planned for construction on nearby property. The court found that the FAA erred in issuing its no-hazard determinations by failing to apply its own standards, and remanded the matter to the FAA. On March 19, 2008, the Department of Transportation issued a Declaratory Order finding that the “privilege fee” imposed by Tinicum Township, Pennsylvania for aircraft operations at Philadelphia International Airport (PHL) is inconsistent with the Anti-Head Tax Act. Tinicum Township is not the airport sponsor; however, portions of PHL are located within the municipal boundary. DOT determined that the “privilege fee” essentially was a landing fee and therefore was prohibited under the AHTA, which permits only the airport proprietor to impose reasonable landing fees. The Declaratory Order contains an extensive review of the Act, as informed by the legislative history and recodification. Tinicum Township has petitioned the U.S. Court of Appeals for the Third Circuit to review the DOT Declaratory Order. The appeal is pending. If upheld, opponents likely will seek injunctive relief through separate, pending judicial proceedings. On March 25, 2008, the U.S. Court of Appeals for the Second Circuit held that the Passenger Bill of Rights adopted by the State of New York was preempted by the Airline Deregulation Act of 1978. The New York law required air carriers to provide basic services for planes facing on-board delay of more than three hours. The court held that the law related to the “service” of an air carrier and therefore is preempted under 49 U.S.C. Section 41713(b)(1). The court strongly suggested, without deciding, that the state law also was inconsistent with FAA’s plenary authority over aviation safety under the Federal Aviation Act. On March 11, 2008, the U.S. Court of Appeals for the Sixth Circuit upheld an airport landing fee charged only to aircraft based at an airport. The case was on appeal from a final decision by the FAA issued in March 2007. The Portage County Regional Airport Authority imposed a fee at the Portage County Airport calculated based on aircraft weight and frequency of use. The fee is imposed annually and applies only to aircraft based at the Airport. In late April and early May, the U.S. Senate debated FAA Reauthorization, but failed to reach agreement. While several key issues, including user fees, appear to have been resolved, senators could not reach agreement on several aviation-related and nonaviation-related matters proposed to be included in the bill. The bill was pulled from the Senate floor on May 6, and there is no timetable on when debate will resume. It is likely that Congress will pass another Continuing Resolution to extend FAA programs and funding beyond their current expiration on June 30; however, the length of the extension is still being debated. Michael O’Donnell has been selected to replace Dave Bennett as the FAA Director of Airports Safety and Standards. Randy Fiertz has been selected to serve in the newly created position of FAA Director of the Office of Airport Compliance and Field Operations. Frank San Martin has been selected to replace Barry Molar as the Manager of the Airports Financial Division. Frank previously held the position of Manager of the Airports Law Branch within the Office Chief Counsel. The FAA recently released proposals to allocate slots at John F. Kennedy, New York LaGuardia, and Newark Liberty Airports. The FAA published its proposed rule for LaGuardia Airport on April 17 (73 Fed. Reg. 20846). The FAA published its proposed rule for JFK and Newark on May 21 (73 Fed. Reg. 29626). Comments are due July 21. On February 1, FAA released a new program guidance letter: Management of Acquired Noise Land: Inventory - Reuse - Disposal. The document includes information on the management, retention and disposal of land acquired for noise compatibility purposes, including criteria for determining whether disposal is required. The Firm has prepared a summary of the guidance, as an update to our 2004 Guide to Airport Noise Rules and Use Restrictions. The Firm is working on a Legal Research Digest on airport governance for the Transportation Research Board Airport Cooperative Research Program. Controversy Continues on the Regulation of Greenhouse Gas Emissions. As reported previously in the Airport Law Alert, the U.S. Supreme Court held in Massachusetts v. EPA that greenhouse gases are pollutants subject to regulation under the Clean Air Act. The U.S. Environmental Protection Agency has stated its intent to respond to the Court’s decision by issuing an advance notice of proposed rulemaking (ANPR) on mobile source greenhouse gas emissions. Petitioners in the case have challenged USEPA’s actions and proposed actions since the Court’s decision and, on April 2, 2008, filed a writ of mandamus requesting that the Court order USEPA to decide immediately whether GHGs must be regulated under the Clean Air Act. Senate Fails to Agree on GHG Bill. In late May and early June, the Senate debated, but could not reach agreement, on the Lieberman - Warner Climate Security Act of 2008 (S.3036). The bill would establish a cap-and-trade regulatory scheme that would include aviation fuels. Aviation Subcommittee Holds Hearing on Aircraft Emissions. On May 6, the Aviation Subcommittee of the House Transportation and Infrastructure Committee held a hearing entitled: “Aviation and the Environment: Emissions." Kaplan Kirsch & Rockwell monitors developments related to climate change and maintains a web page dedicated to this issue.